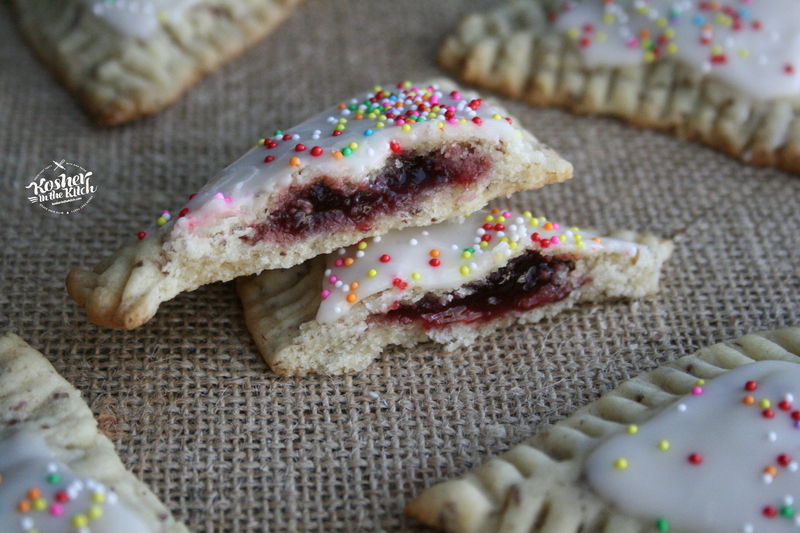 Pop Tart Hamantaschen - Kosher In The Kitch! 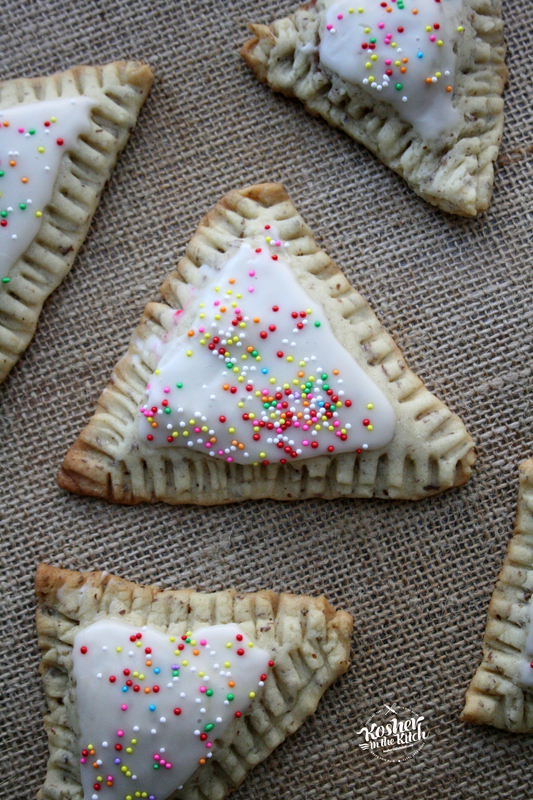 Pop Tart Hamantaschen - Kosher In The Kitch! Cream together flax seed water mixture, sugar, oil, and vanilla. Slowly add flour and baking powder. Mix together. The dough might be crumbly, use your hands to smooth it out and combine it. Roll out dough on floured surface. 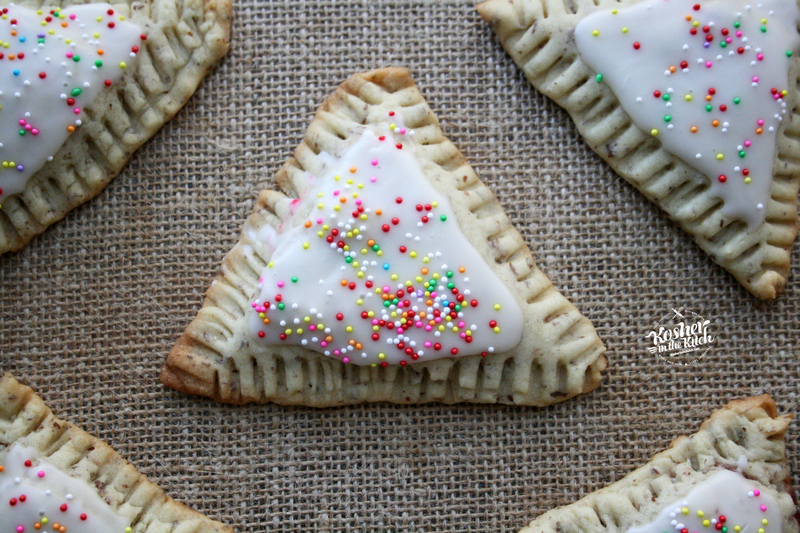 Cut out triangles using a triangle cookie cutter. 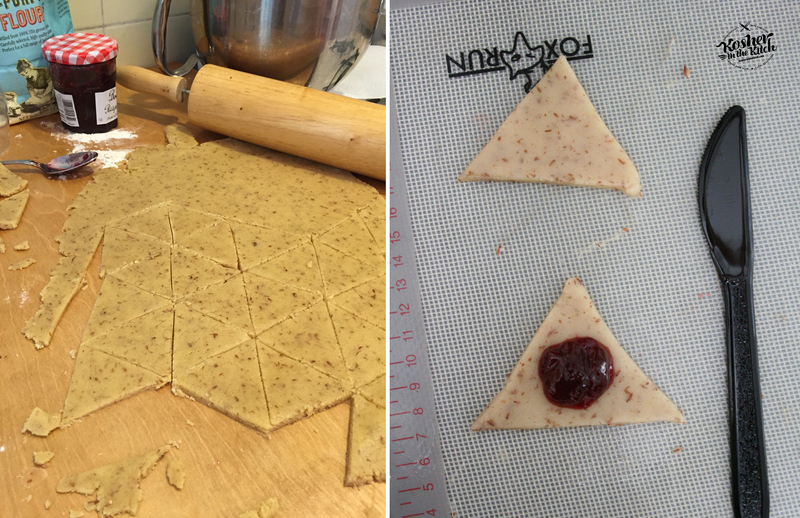 If you do not have a triangle shaped cookie cutter, trace out a bunch of hexagons connected then cut them out to create triangles. Fill center of triangle with 1/2 tsp. jam then cover with another triangle gently pressing the edges down. Using a fork crimp the edges down all around. Bake on 350′ for about 15 minutes. Once cookies have cooled off, combine frosting ingredients and frost the center of each triangle and immediately place sprinkles on top before the frosting hardens. 2. how many days in advance can I make them so that they are ready for Wednesday nigh/Thursday? Hi! I use canola oil. They will stay good for at least two or three days in an airtight container. If I use the eggs is that instead of the water or the water AND the flax? Hi Susan! If you want the dough to be vegan, use the flax seed water mixture if you want classic dough use two eggs in place of the flax seed water mixture. Can you please tell me if this will work 100% if I have to make these with Gluten Free flour while also keeping it vegan..? Soooo much of the time, regular vegan recipes cookie recipes do not ever accurately convert over to a gluten free version. The flour and liquid and sugar ratios are always slightly “off” when you try swapping in gluten free flour cup for cup for wheat flour…and I never know what to do to fix anything. 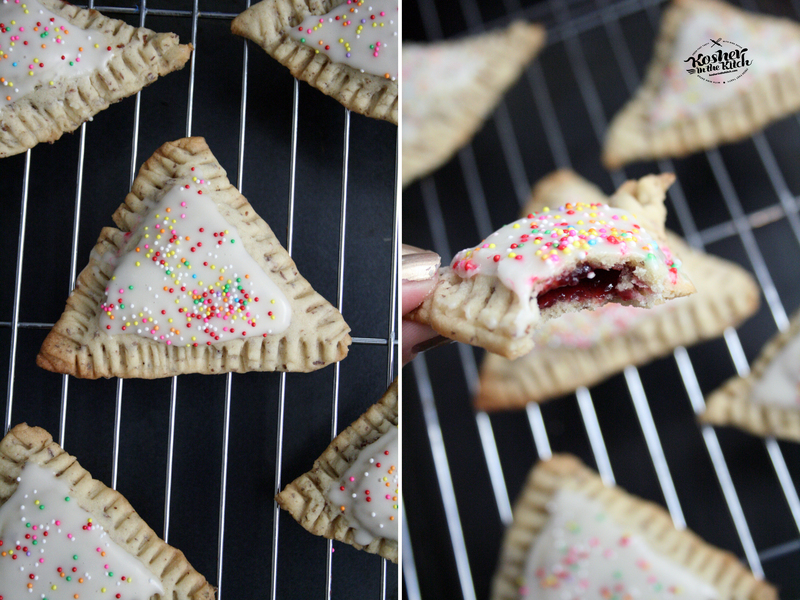 Maybe by creating a recipe for batch of gluten free vegan pop tart hamantaschen that taste awesomely like the real thing…? Hi Alli! I have not baked this recipe using gluten free flour so I cannot tell you it will come out if making the swap. I would like to experiment with future recipes using gluten free flour and will keep you updated when I do. If you try the recipe using gluten free flour please update us here and let us know how it comes out. 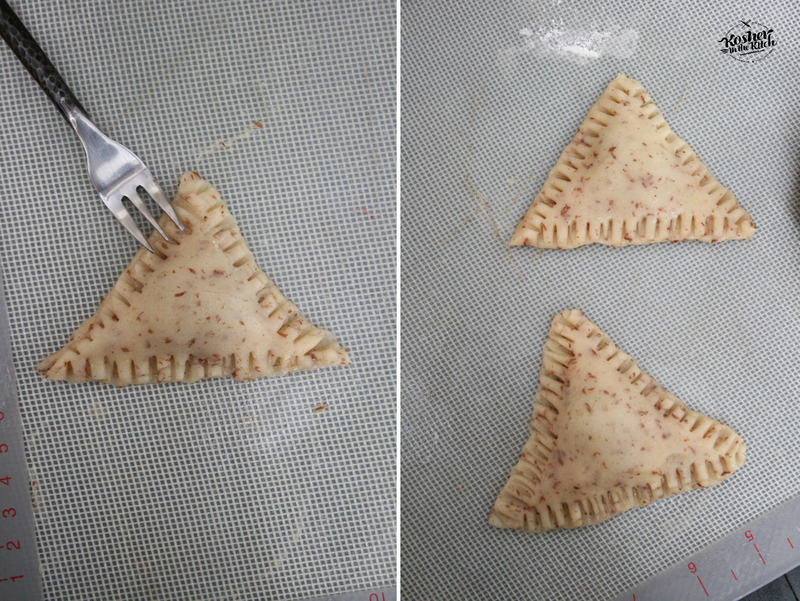 How big of a triangle cookie cutter did you use? 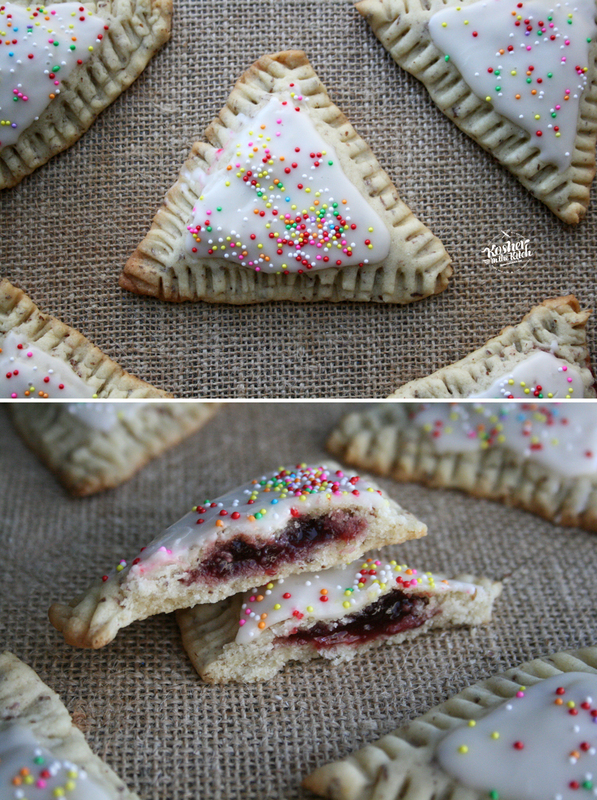 You can use any size, I have used both large and small to create different sized pop tart hamantaschen. Hi! Do you know if these freeze well? Thanks! Yes the hamantaschen dough freezes well just hold off on icing it with sprinkles for after you defrost it. These look so cute and yummy! Think I will make them! Love your blog!